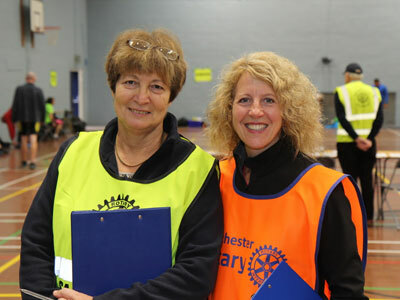 As a Salisbury Rotarian I have been involved with the start of the marathon for several years, initially volunteering in the early morning, issuing the race registration numbers. I was just a small cog doing my bit to ensure all runners and walkers had their numbers and then I pointed them to the start line. Three years ago, I took over as Start Location Manager, which then opened my eyes to the complexities of the task. In the run up, roping in lots of volunteers is always a challenge. 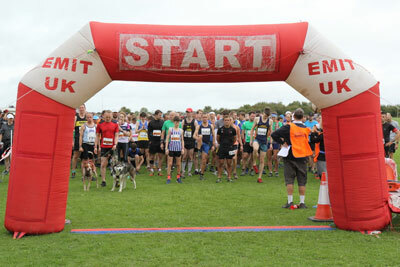 It is also vital that every volunteer is given a briefing and additional information to help the participants on the day. Three days before the event I collect the race numbers and ensure that they all tally with the final booking list. The race numbers are all placed in batches ready for the registration volunteers to allocate to each participant. We set up the day before, to minimise the risk of possible problems. Last year the weather forecasted rain, thus we had to ensure we had mats and mops available in the gym to avoid slipping on any wet surfaces. We get up early and are at the gym opening up at about 7.00am and we usually find a few participants have already arrived before us! Despite all our careful preparation, we usually still encounter a few problems on the day. These require an immediate response and solution, fortunately we have an experienced team that can deal with almost anything. 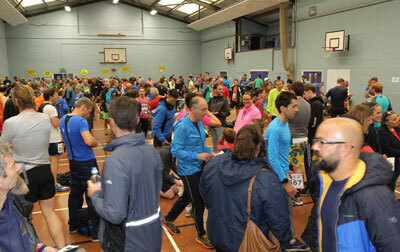 The participants arrive, check in and are given their race numbers. Last year we placed lists around the gym so that anyone could check their name and number allocated. In addition to their race number each participant is given 4 safety pints with which they can attach their race number to their clothing. We also hand out a numbered tag for their baggage. We provide a transportation service so they can have their belongings sent on to Winchester where, later in the day, they will be able to pick them up after they have crossed the finish line. Modern technology plays a vital part as the race numbers are microchipped. In addition the relay racers need a special relay tag that they can pass from runner to runner at the three change stations (four persons per relay team). The majority of participants have entered and paid in advance but we always get a few last minute entrants who turn up and enter on the day, paying an extra premium for the privilege. Processing these last minute entrants is streamlined as competitors can input their details on computer, pay with cash or by card and be given a race number within minutes. The high point on the day is to see everyone gearing up and making preparations to set off, the noise and excitement is infectious then all of a sudden there is silence – everyone has gone!! Our merry band of volunteers then collect the unused numbers, take down the signs, put the tables and chairs away and dispose of any rubbish. The last of the runners bags are loaded onto the bus, ready for transportation to Winchester. We lock the hall and depart in less than 30 minutes. Here’s looking forward to the next marathon (Sunday 7 October 2018).